Wooow!. I'm really so crazy & a challenge's addict!!.. But I saw this one and I will collaborate in post a designs every Tuesday with this colors!. Won't be surprise if you see the same Red, Orange & Yellow designs every Tuesday!... Ok is not that bad, just every Tuesday won't be a problem.. (I hope!) So, here is the design for today!. Although I still need to do one for the past week, puuufff!!!.. 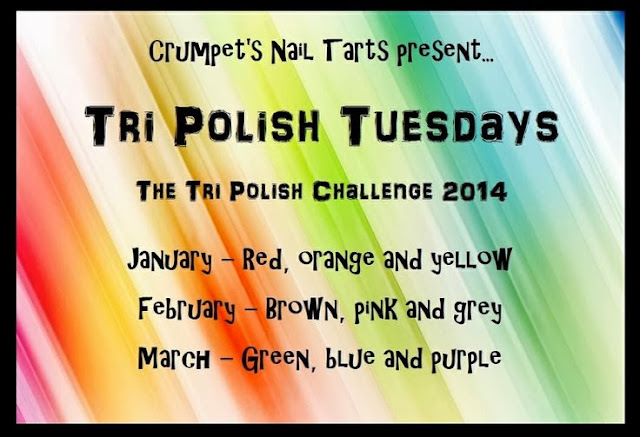 Tri Polish Challenge 2014 – Tri Polish Tuesdays! We are going to be posting each Tuesday (although you don't have to post every week) starting 7th January. Three colours will be chosen for each month and you post up to four manis using those three colours, plus the allowed extra colours of black, white, silver, gold and glitter toppers. The difference this year is that you don't have to stick to the same three polishes for the whole month, as long as you stick to the three chosen colours and allowed extras. At least one mani must contain all three colours, while the others must contain as least two of the chosen colours. Dates and Inlinkz links will be added in a separate doc in the next few days.